The Aim MTEL-50 is a Refractor telescope. It’s 50mm diameter lens captures plenty of light for crisp, bright images and startling detail. It comes with an adjustable table top mount which is sturdy, rugged and easy to operate. 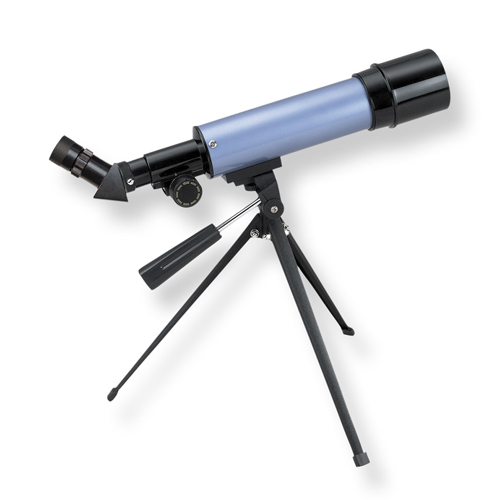 This Aim telescope is suitable for viewing the Moon and planets, and because it is a refractor, it is good for terrestrial observation too. The MTEL-50 comes with two Barlow lens and two Kellner eyepieces, 9mm and 20mm for best viewing results. The Aim telescope is a simple to use ‘point and aim’ which makes it perfect for beginners at astronomical and terrestrial viewing. Not suitable for longer exposure astro-photography as the table top mount will not track objects over time.